This EA can be used with a large number of sets of settings. The type of the basic strategy is selected by switching the "Breach_else_Channel" parameter: channel breakout or trading withing the channel. The basic strategy is divided into two blocks (A and B) with different filters and logic for performing trades. They can be used both in conjunction and separately. 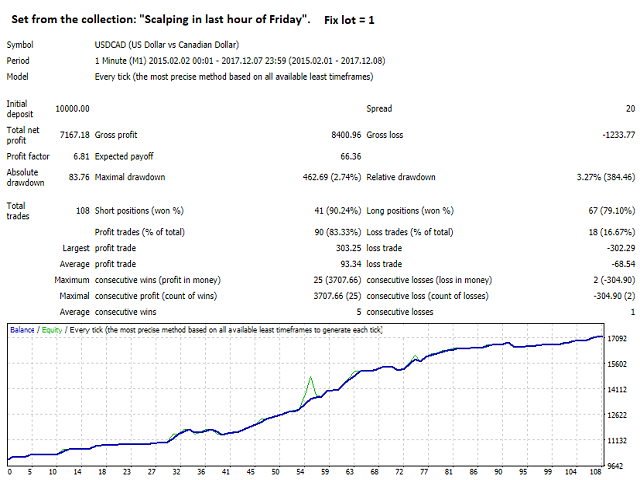 You can perform the optimization for any instruments and trading hours. It is possible to consider the economic news in testing, since the EA contains them (from January 1, 2015 to December 31, 2017). The "Pass_of_News_else_Trade_at_News" parameter determines the trading logic during the release of economic news: do not trade at the specified time intervals during the news release, or trade only at the specified intervals during the news release. While testing or at real work, use the sets of settings from Сomments. 1. During live operation of the expert the GMT offset parameter is determined automatically based on local time of the computer (GMT_Offset_AUTO=true). This parameter provides synchronization of the expert settings with the MetaTrader 4 server time. to compare the GMT time in expert information area on the chart of currency pair, to which the expert is attached, with http://time.is/GMT (or other reliable source). 2. In order to activate the News filter function, enable "Allow WebRequest" and add https://sslecal2.forexprostools.com/ to the URL list for WebRequest. 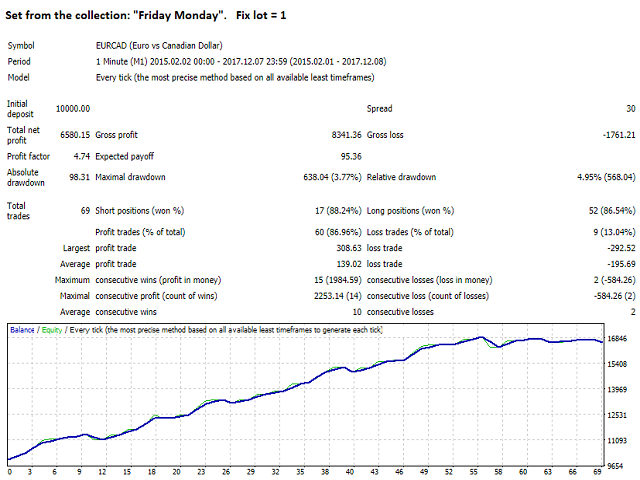 To do this, open Tools > Options > Expert Advisors. Check the option "Allow WebRequests for listed URL:". Add https://sslecal2.forexprostools.com/ and click OK. The EA contains a news archive (01.01.2015 - 31.12.2017), which is used for testing. 3. By default, in the EA settings, the risk per trade is set to 1% of balance. After testing on real accounts this parameter can be changed depending on your preferences. I recommend using a fixed lot (Use_Fix_Lots) or a recovery money management. 4. The expert works on any timeframe equally well, as it automatically takes the necessary data from multiple timeframes. As the expert uses multiple timeframes for the analysis, it is necessary for the quotes of all timeframes (M1, M15, M30, H1, H4) to be downloaded in the terminal for testing. At the same time, the testing itself can be performed on any timeframe (when using the test model: "Every tick"). 5. For brokers with the rule "First In First Out" enable the parameter FIFO_MODE = true. 6. The EA logs information on spread, slippage and other useful information when performing trades, and also when it is possible to make trades. after viewing, close the file (so that the expert could write down information further). 7. If you use an expert on different currency pairs, then there is no need to change the magic numbers ("magics"), since the expert identifies the transactions simultaneously by magic number and by currency pair. Okay. After 3 months of testing in my real account I can say this trategy does not work at all. It has been 3 months of almost - straight - losses. 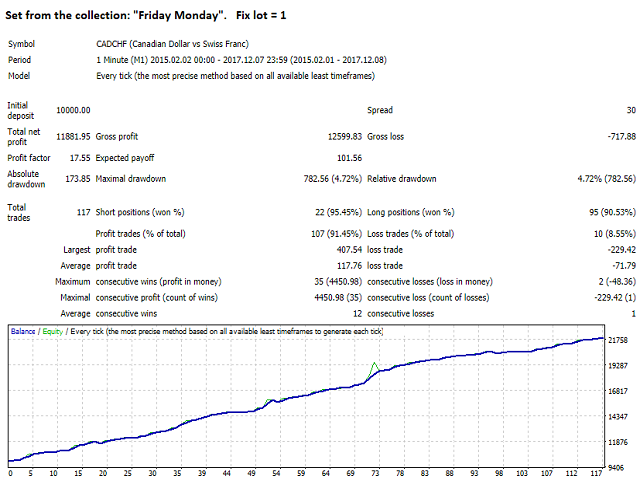 The gaps that sometimes happen during the week ends leave you with huge losses that the system cannot recover with the small winnings it does have. I have been using a 2ms VPS, an ECN account, I've used the sets given by the developper, I've cut down on the currencies that were "bad" as the developper suggested and the losses have been constant. So I believe this is a completely objective review that this system does not work. Maybe it did a year ago (when I did not have it) but it certainly does not work nowdays. Профессиональный разработчик - профессиональный эксперт - отличная работа! Стабильный, безопасный, с низким риском. Поддержка автора на высшем уровне. Прекрасный мультифункциональный советник! Автор проделал колоссальную работу - оптимизировал, протестировал, проанализировал результаты в разных режимах, используя все возможные инструменты. В результате Константин предоставил реально прибыльный софт, который отлично оптимизирован для большого количества инструментов! Я очень доволен этим продуктом и выражаю благодарность Константину! 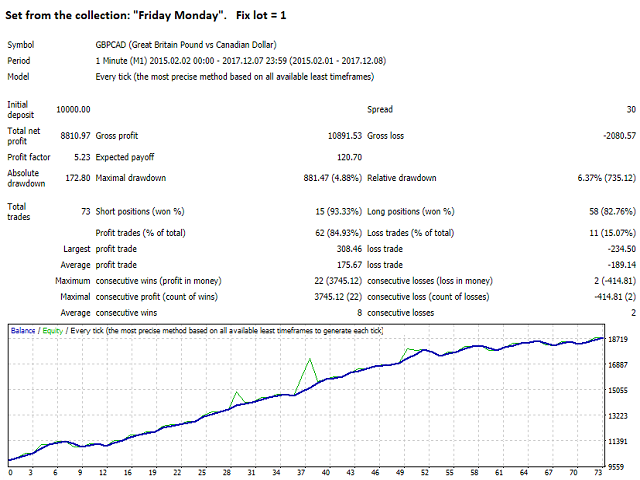 I have been using Breakthrough strategy for 4 months on a couple of ICM accounts. Performance is identical to the author's signal Breakthrough strategy ICM. As far as I can see it is only the friday monday sets which have traded - there may have been others which I have not spotted. 1. Profitable strategy - which is of course the whole point. 2. Konstantin is very helpful as you can see from his reply to my questions in the comments. 3. I like the fact the this is a different strategy so in my opinion you can safely run it with other EA's. 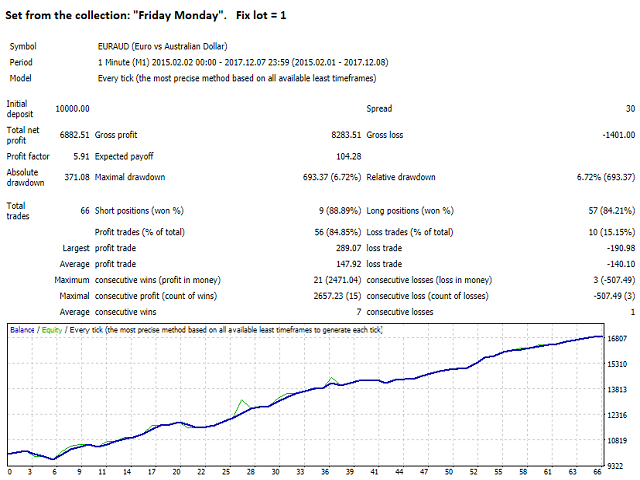 The friday monday strategy leaves trades open over the weekend on pairs which tend not to gap. 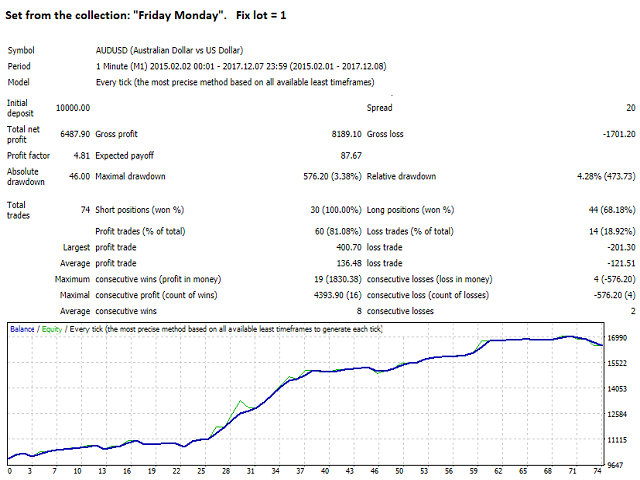 The spreads are very high when the market opens on a sunday evening so I recommend not monitoring as the market opens; much better to look at the profits on Monday morning - now that is a good way to start the week! 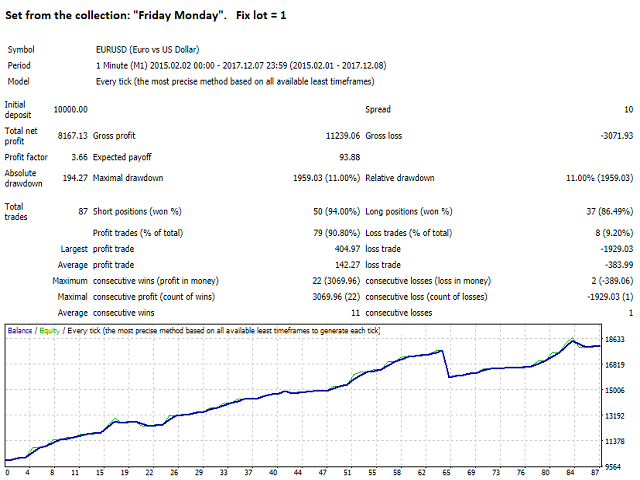 Update 2018:07:04: since my last review had many good starts to the trading week thanks to Breakthrough Strategy. Glad to see this EA is gaining the popularity it deserves. 1) Completion of algorithms, correction of the found mistakes. 2) The history of news for the strategy tester is updated to December 31, 2017 ("NewsFilter"). 1) The algorithm is improved. 2) Field for entering dates for skipping.